Unrivaled Dyson suction. Light to maneuver. Weighs just 12.15lbs for easier lifting up stairs and around the home. 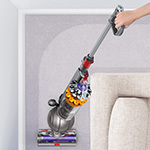 The Dyson Small Ball vacuum is easy to store around the house, with a collapsed height of just over 31 inches. 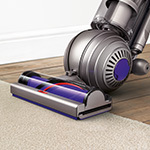 Cleaner head automatically adjusts between carpets and hard floors – sealing in suction. Direct drive motor pushes bristles deeper into carpet. 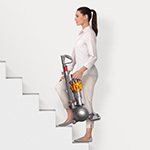 Dyson Ball™ Multi Floor 2 is light to maneuver and steers easily into difficult places. Instantly change direction with a turn of the wrist. Advanced cyclone technology. 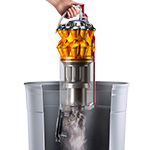 Unrivaled Dyson suction. 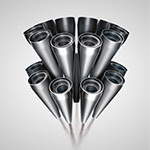 Advanced Radial Root Cyclone™ technology channels airflow through the center of the cyclone assembly. This maximizes suction, to capture more microscopic dust. Ball™ technology. No more awkward moves. Core components are housed within a ball, lowering the machine’s center of gravity – increasing stability and maneuverability. Self-adjusting cleaner head. Seals in suction across all floors. Active base plate automatically raises and lowers to seal in suction across all floors. Combined with a powerful motorized brush bar, it deeps cleans dirt throughout the home. Flexible floor to ceiling cleaning. Dimensions 41.93" x 15.59" x 13.39"